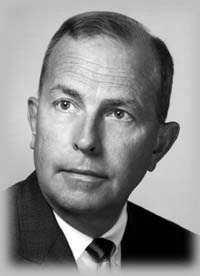 UCLA's Administration Building was renamed in 1968 for dynamic Franklin David Murphy who served as Chancellor from 1960 to 1968. Murphy received a B.A. from the University of Kansas in 1936 and an M.D. from Pennsylvania in 1941. He joined the Kansas University Medical School and became its Dean. In 1951 he was named Chancellor of the University of Kansas. In 1959 he was offered the UCLA chancellorship, then unfilled. Friends warned it was an "impossible job"-- all responsibility with very little authority and a constant fight with a centralized administration at Berkeley. Murphy accepted the challenge. At UCLA he plunged deeply into community affairs, developed a program of interdisciplinary institutes and study centers, and restructured the College of Applied Arts into the College of Fine Arts. During his administration the School of Library Service was established as was the School of Architecture and Urban Planning. He played important roles in the realization of Pauley Pavilion, the establishment of the Jules Stein Eye Institute, and the passage of the 1962, 1964, and 1966 bond issues which provided UCLA with $95,000,000 in construction funds. Dr. Murphy was lured away in 1968 to accept the position of Chairman of the Board and Chief Executive Officer of the Times Mirror Company. It was the end of an era in which this talented, versatile administrator made a tremendous impact, elevating UCLA to a great prominence. Franklin Murphy died June 16, 1994 in Los Angeles. Read his obituary in the New York Times.